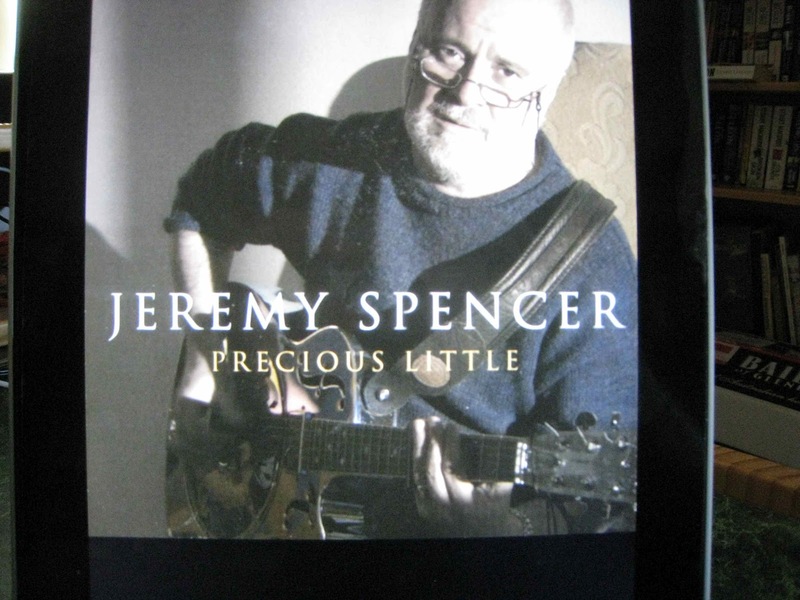 However, if you have been around that long and you’d been listening back in the Mr Wonderful or Blues Jam at Chess era, you’d probably recognise Jeremy Spencer as the slide guitar specialist until his departure from the post-Peter Green lineup in February 1971, dissatisfied with his performances and the rock’n’roll lifestyle. The original Fleetwood Mac was, to all intents and purposes, a splinter off the John Mayall’s Bluesbreakers trunk (Peter Green, guitar, and the John McVie/Mick Fleetwood rhythm section that’s still in place today) with the nineteen-year-old Spencer added as a slide guitar foil for Green. The Green/Spencer axis didn’t work as well as it might have, which accounted for third guitarist Danny Kirwan’s arrival on the scene, so there wasn’t a whole lot of Spencer on Albatross or Oh Well and Then Play On was entirely lacking in Spencer compositions. On stage, on the other hand, Spencer came into his own, with impersonations of the likes of Elvis and Buddy Holly and songs like the incomparable rock’n’roll pastiche Somebody's Gonna Get Their Head Kicked In Tonight, the sort of thing that appeared on his 1970 solo album. The raucous on-stage persona was, however, quite at odds with his off-stage demeanour, and after Green departed in 1970 (replaced by keyboardist Christine Perfect/McVie) he contributed some fifties-style material to Kiln House before the band departed for a Stateside tour early in 1971. There are various versions of what happened when the Mac hit the west coast, including dissatisfaction with what he heard on a concert recording, the aftermath of a mescaline trip, a fragile mental state, premonitions and an earthquake in Los Angeles shortly before the band arrived there, but on the afternoon before a gig at the Whisky A Go Go, Spencer headed off to visit a bookshop on Hollywood Boulevard and didn’t come back. When they tracked him down he’d joined a religious cult, the Children of God, apparently of his own volition and that was more or less that. Forty years later he’s still a member, though the group is now known as The Family International. There were, over the intervening decades, various musical activities within the organisation, free concerts, an album (Jeremy Spencer and the Children), a record deal with Atlantic Records and a deal of travelling with stints in Brazil, Italy, the Philippines, India, Ireland and Germany. These days his main gig involves writing and illustrating, but he’s still playing music and a visit to a Norwegian blues festival in 2005 resulted in a five day session that produced Precious Little. Given the latter part of the back story, those looking for a return to the old raucous Spencer were always going to be sadly disappointed, and while there’s the odd track that doesn’t work as well as it might, it’s obvious that there’s still a spark or two left after thirty-five years, and the results are probably a bit better than most old-time fans would expect. There’s a touch of cliche about Bitter Lemon (Take that bitter lemon and squeeze it into sweet lemonade) and more in Psychic Waste as Spencer has a go at the entertainment industry and popular culture, but there’s an elegant take on Elmore James’ It Hurts Me Too, with a precision to his slide playing that wasn’t quite there forty years ago, a return to early rock in a cover of Fabian’s Please Don't Stop that won’t surprise anyone who’s heard his Fleetwood Mac era fifties inclinations, a rewrite of Corrina Corrina (Serene Serena) that’s tasteful but doesn’t do a whole lot for Yours Truly, a healthy dash of twelve bar in Dr. J, complete with horns and a midtempo shuffle through a world of Trouble and Woe. It’s back to Elmore James territory for a languid take on Bleeding Heart, with unhurried shimmering slide that’s very much in the less is more school of playing, something that’s also evident on the instrumental Many Sparrows. The chugging Trouble and Woe provides a suitable lead in to one of the album’s high points, Maria de Santiago, dedicated to Spencer’s patron saint and an antidote to the foregoing Trouble and Woe. Things drop back a notch for a cover of Slim Rhodes’ Take and Give before the album’s title track brings things to a close with fluid fingerpicked guitar lines. If you’re looking for a return to the stinging Elmore James schtick from forty-plus years back, this won’t be your cup of tea, but on the other hand if you’re after a relaxed take on the blues from a guy who’s managed to make it through the intervening period with his chops more or less intact, this might just be your cup of tea. Perhaps a tad too laid back, but there’s always a niche in these parts for well played late night blues, and this fits the bill for mine.